Trampolines are incredibly popular among small kids and teens, but even some adults adore them. Some find it safe, some think that they’re too dangerous; the truth is somewhere in the middle. Every physical activity carries some risk, but that doesn’t mean we should become couch potatoes to prevent injuries to happen. 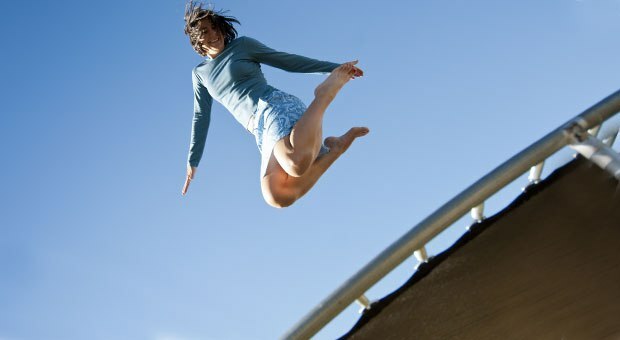 Instead, it’s crucial to be cautious and follow safety guidance when doing anything, including jumping on a trampoline. Common injuries associated with jumping on a trampoline include broken bones, concussions, strains and sprains, cuts, scrapes and bruises, as well as neck and head injuries. People can get hurt if they land wrong while jumping or doing somersaults and flipping, trying stunts, jump or fall off the trampoline. However, most injuries happen when there’s more than one person jumping on a trampoline. What can be done to prevent trampoline injuries to occur? Safety nets can make a difference, but only if they’re assembled properly. Otherwise, you’ll only get a false sense of security. Kids under the age of five are usually lighter and don’t have enough co-ordination to control a landing, therefore they’re at a higher risk of getting injured. For that reason, children under six should avoid trampolines. Nevertheless, no kid should be unsupervised when on a trampoline. But, what’s even more important, only one kid/person should be on a trampoline at a time! The most severe injuries are neck and head injuries. In case the kids haven’t been properly coached, they shouldn’t be flipping or doing somersaults in order to avoid serious health complications. Encourage your kids to bounce in the middle of the trampoline not to jump off it. Climbing underneath the equipment should be banned. If you consider buying a home trampoline, check out this trampoline guide to make sure the product you choose is safe enough to be used. It’s necessary to check the equipment often and, if you find a safety net, protective padding or any other part of the equipment damaged, repair or replace them. Talking about protective padding, it should be adequate, properly placed and in a good condition. And of course, active adult supervision is inevitable.